Tetracycline is a broad-spectrum polyketide antibiotic produced by the Streptomyces genus of Actinobacteria, indicated for use against many bacterial infections. Its mode of action is by protein synthesis inhibition. As a broad-spectrum antibiotic it was generally used in the treatment of infections of the urinary tract, respiratory tract, and the intestines. The use of Tetracycline has declined in recent years, due to the onset of antibiotic resistance. Despite this, it remains the treatment of choice for some specific indications. Today, it is commonly used to treat moderately severe acne , and more recently, rosacea, and played a historical role in stamping out cholera in the developed world. Tetracyclines act bacteriostatically on grampositive (e.g. staphylococci and streptococci) and gramnegative bacteria (eg, brucella, campylobacter, and neisseria). In addition, they may be used to treat anthrax, plague, tularemia and Legionnaires' disease. It is used to treat many gram-positive and gram-negative bacteria and some protozoa. The tetracycline inhibits (like macrolides, lincosamides, aminoglycosides and chloramphenicol) protein biosynthesis at the bacterial ribosomes. They prevent the attachment of the aminoacyl tRNA to the acceptor sites of the 30S subunit of the ribosomes and thus the extension of the peptide chain. In turn, the bacteria can not create any proteins (although, it can "live" for a while with the ones, it had produces before being exposed to tetracycline). However, it cannot replicate, since this requires a plethora of newly synthesized proteins. The low toxicity to humans can be explained by the selectivity for bacterial ribosomes against eukaryotic ribosomes. The side effects of the tetracycline are due in particular to their strong calcium-binding properties. Tetracycline should not be used in pregnant women, nursing mothers or children during the growth phase because they are incorporated into the bones and teeth, which leads to yellowing of the teeth, increased caries and increased bone fractures, especially in newborns. Tetracycline passes into the mother's milk. Due to their broad spectrum of activity they also decimate the natural colonization flora of the bowel relatively strongly and not infrequently lead to colitis as well as changes in the vaginal microbial flora. Important note: this list is not complete! In case of any unusual signs, immediately consult your doctor! When ingested, it is usually recommended that the more water-soluble, short-acting tetracyclines (e.g. plain tetracycline, chlortetracycline, Oxytetracycline, demeclocycline and methacycline) be taken with a full glass of water, either two hours before or after eating. This is partly because most tetracyclines bind easily with magnesium, aluminum, iron and calcium (all of which are abundant in a normal diet) and is thereby deactivated by these ions. Partial exception to this rule applies for doxycycline and minocycline, which may be taken with food. Dairy products and (mineral) supplements should be avoided during the treatment. Tetracycline hydrochloride is a yellow crystalline, odorless powder, and often incorporated into Tetracycline hydrochloride ointment for topical administration. Doxycycline and minocycline are usually absorbed in the intestine by more than 90% (tetracycline: 80%). They are excreted in both urine and feces at high concentrations in a biologically active form (since it is not metabolised) mainly via the bile, but also via the kidneys with a half-life of 15 h (tetracycline: 9 h). For doxycycline the dose range for adults is usually between 100 and 200 milligrams per day, and for children about 2 mg/kg body weight. Since bacteriostatic drugs (like tetracycline) may interfere with the action of bactericidal drugs (like penicillin), it is advisable NOT to combine these antibotics. Doxycycline and minocycline are semi-synthetic derivatives which can be prepared from oxytetracycline. Tigecycline may also be considered a tetracycline antibiotic, though it is usually classified as a glycylcycline antibiotic. The tetracyclines are a large family of antibiotics that were discovered as natural products by Benjamin Minge Duggar (Aureomycin, in 1945). However, Nubian mummies have been studied in the 1990s and were found to contain significant levels of tetracycline; there is evidence that the beer brewed at the time could have been the source. Tetracycline sparked the development of many chemically altered antibiotics and in doing so has proved to be one of the most important discoveries made in the field of antibiotics. The price of tetracycline rose from $0.05 per 250 milligram pill in 2013 to a whopping $4 a pill in 2015. Such a price change (which exceeds 1,000 percent) is a relatively new phenomenon for generic drugs. It is marketed under the brand names Sumycin, Tetracyn, Lymecycline, and Panmycin, among others. Actisite is used for for periodontal pocket placement and consists of a 23 cm (9 inch) monofilament of ethylene/vinyl acetate copolymer, 0.5 mm in diameter, containing 12.7 mg of evenly dispersed tetracycline hydrochloride. Take this medicine by mouth with a full glass of water. Take it on an empty stomach, 30 or 60 minutes before a meal. Do not crush or cut open the capsules. Follow the directions on the prescription label. Take your doses at regular intervals. Do not take your medicine more often than directed. Do not stop taking except on your doctor's advice. Report any side effects to your prescriber or health care professional as soon as possible. 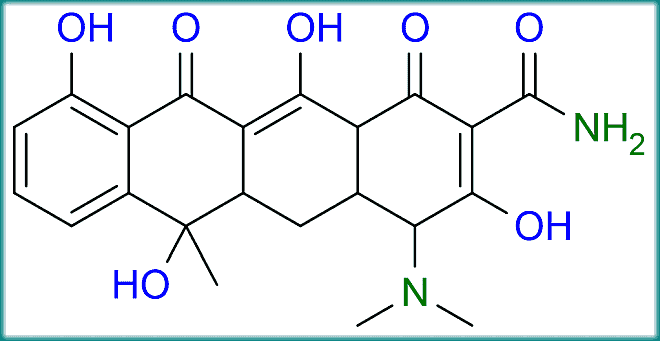 Tetracyclines are so named for their four ("tetra-") hydrocarbon rings ("-cycl-") derivation ("-ine"). Bacteriocidal: An agent which is capable of killing bacteria: antiseptics, disinfectants and some antibiotics. Bacteriostatic: An agent which capable of inhibiting the growth or reproduction of bacteria: antibiotics which are not bacteriocidal. Although it sounds more effective to kill the beast straight away, in real life infections, the distinction is arbitrary and mostly of academic value. Why? Because bacteria, which cannot reproduce, are quickly killed by the immune system. Actually, the reason for most bacterial infection is indeed, that the immune system was (temporarily) not able of restraining them.